The UK entry was travelling with the rest of his delegation in Baku, Azerbaijan, when the vehicle had a problem and he was in danger of being late for rehearsals. But police came to his aid, taking the 73-year-old singer to the Crystal Hall in time to take part. Engelbert has also been enjoying a bit of home comfort while out in Baku, visiting the London Pub where he enjoyed tucking into fish and chips as well as playing darts, one of his favourite pastimes. The singer - who is representing the UK with his song Love Will Set You Free - also met up with Irish entry Jedward this week. 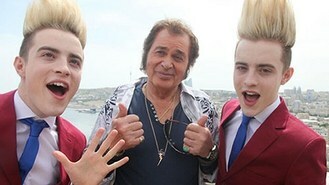 And he was introduced to Azerbaijani-born pop superstar Emin at the Baku Hilton as Eurovision fever engulfed the city. Emin - who will be performing in the contest on Saturday night between the performances and the results - reminded Engelbert how successful his music continues to be in eastern Europe.